October 13 ——- Tony will take Original Music to the University of Kentucky’s Chandler Medical Center Auditorium to record a segment for Tim Farmer’s Homemade Jam, a new Television Show on KET that features the talents of Kentuckians. Arlo Pennington and his Band as well as Lauren Mink will also Tape segments. October 10 — —- Tony and the Honky Tonk Version of BIG UGLY will perform at “A Night in Horse Country” at The Signature Club at The Landsdowne in Lexington, KY.
September 21 —- The Big Ugly Bluegrass Band onstage at Poppy Mountain for 2 Shows, 12:00 Noon and 5:30 PM. 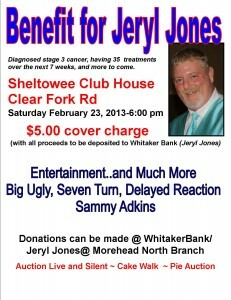 February 23 I’ll be participating in a Benefit for my long time friend Jeryl Jones, at the Sheltowee Clubhouse at what used to be the Golf Course on Clear Fork Road. Festivities begin around 6 PM…See the Facebook Event for more details. Tony is now hosting The Country Jukebox every Tuesday evening from 7 to 10 PM on Morehead State Public Radio, 90.3 FM. and still hosting The Country Jukebox on 90.3 FM every 2nd Friday at 7 PM. The Country Jukebox features Americana, Classic Country and Current Country music. Every Saturday from 11 AM to 2 PM Tony hosts Bluegrass Railroad on 90.3 FM with Bob Christian. Bluegrass Railroad fills the void left with the passing of Sandy Knipp who along with Christian produced one of the longest running radio broadcasts in the region, Bluegrass Diversion. Pence and Christian’s Bluegrass Railroad will continue the tradition of playing called in requests as well as play current bluegrass music on the cutting edge of the genre. This is an event sponsored by Morehead Tourism celebrating local artists and eateries, whom will be presenting their cuisine. Arts and Eats will close the street beside the Rowan County Arts Center. Big Ugly doing about a one hour concert at 3 PM. Bring a Picnic Basket and enjoy Live Acoustic Music in this Child Friendly Venue on the CCC Trail just South of Morehead, Kentucky. Seating on the Deck or the Lawn. This Show will feature many Original Tunes and some Cover Music in Tony’s laid back style. Longtime band mate Stan Dixon will be making a return to performance after a 3 1/2 year layoff as he joins Tony and guitar man Conner Copher for this 7:30 PM show on the Amphitheatre Stage. 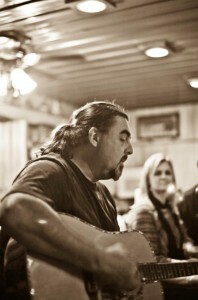 Tony Pence performing the Fuze the Muse Project Song “Down$tream” as part of a one hour Acoustic Solo Performance of songs written by Pence, and songs co-written with Clint Land and Fred Brown. Crystal kelly: Love you and Paula LOVE YOUR SONGS BEST BLUE GRASS SINGER I KNOW.